Krone North America’s BaleCollect bale accumulator allows operator to pick up to three bales (five bales with the Krone BiG Pack 890 baler) together at the same time. In the field, the hydraulic drawbar is retracted and the bale accumulator runs in line with the bale chamber. When a bale leaves the bale chamber and moves on to the BaleCollect, it passes over a detecting sensor which signals to push the bale to the side. The next bale is then pushed to the other side. Once the third bale arrives on the bale accumulator, all bales are pushed off the machine together. In transport position, the sides fold on to the table, thus reducing transport width to just under 10 feet, with a transport length of just under 13 feet. 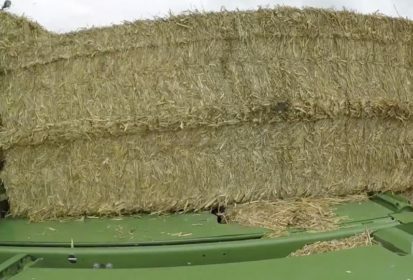 The bale accumulator pulls like a second trailer behind the Krone BiG Pack Baler, a big advantage when traveling around bends or through narrow gates. Weighing system: BaleCollect features a weighting system, which captures and stores the weight of each bale on the machine. The new BaleCollect also features a telescoping drawbar for safer, easier transport at speeds up to 50 km/h. A telescoping drawbar breaks the connection between the bale accumulator and the baler, allowing the accumulator to track behind the baler like a second trailer. Bounce has also been eliminated due to the brake being designed to handle the extra weight.